Stanton has been making history in the turntablist world with our industry standard setting cartridges for 59 years. Beginning with the release of the first ever microgroove phono cartridge in 1948 under the Pickering name (yep, that's us too), we have pioneered more stylus and cartridge technology than any other manufacturer to date. After over a half century of focus and tweaking, we bring you the finest line of Stanton cartridge models ever made. Infused with all of Stanton's world famous patents and ground breaking technology, then designed with our edgy DJ style, you've got to get your hands on these needles to experience this level of quality. Designed for the ultimate clarity of sound, perfect for recording. Designed for cost effective clarity, the industry standards for any and all applications. Tight suspension & unmatched tracking force are perfect for the turntablist. Tight tracking and high output make it perfect for the scratch or mix DJ. Combo included both elliptical for recording and spherical for DVS DJs' club playback. Stanton uses aircraft grade aluminum tubing unique to each cartridge model based on their application. Each Stanton damper is made up of special custom compounds of synthetic grade rubber based on specific cartridge model. Alters the magnetic flux based on the movements of the stylus. Provides rigidity and stability to assembly and determines application of needle. Stanton patented enclosure protects the stylus for extreme handling and will not dent cantilever during drops. Stanton uses jewelry grade diamonds in their needles, which are less porous than commercial grade (commonly used in other manufacturers' cartridges), and produce better sound quality. Make sure the turntable is placed on a solid base or stand to prevent side-to-side movement during scratching. A solid surface will absorb heavy vibrations and help eliminate feedback (which results as rumble through the mixer). Always check to make sure that your turntable is level (horizontal). A turntable that is not level is likely to skip and cause playback issues. Most turntables can be leveled by adjusting the four feet independently on the bottom of the turntable (rotate feet until turntable lies horizontally). Set the anti-skate control to "0" when scratching, anti-skate helps keep the needle centered in the groove during forward playback. As the needle pushes up against the groove of the record, anti-skate pushes the styli back into the center of the groove. However, while back spinning or scratching, this force will cause the needle to jump out of groove and skip. For this reason you should always leave anti-skate on "0" while scratching. Break in ("breaking in" a cartridge means loosening / exercising the suspension) your cartridge suspension by placing the needle on a locked groove (a groove which never ends found on most scratch/battle records) and playing the record on 33 RPM for 15-minute intervals. Simply leaving the needle in groove overnight or for extended amounts of time may also break in the suspension. If your needle shows excess "wobble" or moves back and forth too much during scratching, your stylus suspension has too much weight on it. If you have a headshell mountable cartridge, check to make sure you do not have a headshell weight installed on your cartridge. If you have an integrated cartridge body, try removing some weight from the back of the tonearm. Some scratch DJs will angle their cartridges 23 degrees on the headshell. Note: Angle outward on S-shaped tonearms (this will emulate the angle of a straight tone-arm and help the needle hold the groove better). Angle inward on straight tonearms this will emulate the placement of an S-arm for fidelity (sound quality). Despite popular belief, it is NOT recommended to reverse the weight of the tonearm. When this is done it defeats the purpose of a proper setup (notice the numbers on the correct side of the tonearm weight). By overweighing the cartridge you actually damage both the styli (needle) and the record. Only reverse the weight on the tonearm if you cannot get the needle to hold the groove otherwise. Do not use records with worn, oversized or off-center holes. This will allow side-to-side movement, which will result in skipping. The problem can be corrected by placing a small piece of tape over the hole on one side. Cut a small "X" in the center of the hole area and fold the flaps down into the hole to tighten the fit. Badly worn vinyl may require a second layer of tape. Keep your needles and vinyl clean with Stanton's VC-1 vinyl cleaner and SC-4 needle cleaner. The major cause of problems in sound and skipping on the vinyl is the lack of proper set-up of the needle and turntable adjustments. The needle is designed to operate at a specific angle to the vinyl. The commonly used 'S-Arm' turntable has several adjustments to correctly position the needle to the vinyl. 1. The first adjustment is the correct installation of the cartridge. Your Stanton cartridge is to be mounted into the headshell as per the mounting instructions included with every cartridge. The 500, 680 and 890 series of cartridges require the use of the two screw mounting into the headshell. For your convenience, these products can be purchased already mounted and per-adjusted from your local Stanton dealer. If you are using these 1/2" mounted products with a headshell in a mobile application or you are doing heavy scratching, you might benefit by using the extra shell weight provided. Once you have installed your cartridge into the headshell. The Master series of products are designed with their own mounting that eliminates the need for a separate headshell and the wiring to the cartridge. The body of the cartridge should be parallel with the centerline of the headshell-tonearm, when viewed from the front to the back. 3. The third adjustment is the needle (or stylus) pressure. Start with the cartridge-headshell assemble mounted into the tone arm. Remove any needle protectors provided. With the tone arm free, adjust the tone arm counterweight by rotating the rear section until the tone arm floats in a balanced condition above the record or mat. See fig. 2 and 3. 4. The forth adjustment is the anti-skate adjustment. If you are using the turntable for playback or recording only, then set the anti-skate adjustment to the same number as the needle pressure setting. If you are using the turntable for back cueing, scratching or other record manipulation, then set the anti-skate setting to "0". See fig. 3. Do not allow the needle to drop onto the mat or the turntable platter during this adjustment. You might damage the needle tip. Now, carefully hold the tonearm in one hand while rotating the numbered ring on the front of the counterweight with the other hand to the "o" setting. Next, without touching the numbered ring, rotate the rear counterweight until the desired needle pressure reading is next to the line on top of the tonearm tube. See fig. 4. 5. The fifth and last adjustment is that of the tonearm height. This will set the tonearm pivot and needle relation with the vinyl. Unlock the tonearm base located in the base of the pivot assembly. Rotate the height adjust ring in the pivot base to read the correct setting for the height of the cartridge that you are using. Check the cartridge/arm height table for the correct setting. Be certain to re-lock the pivot base when adjustment is completed. See fig. 5. The above are correct tone arm settings when using a Stanton cartridge on a standard 'S-Arm' turntable. Please make certain that the tone arm is balanced to float horizontal above the platter at "0" setting before dialing in the desired correct stylus pressure. The Stanton STR8 series of turntables are designed specifically for the scratching DJ. Due to the special straight line tone arm, they do not have an anti-skate control setting. They do not have a tone arm height adjustment. You do not have to make any settings for anti-skate or tone arm height. Please follow all other instructions as below. 2 to 5 grams stylus pressure setting. Every DJ knows about the problems of distorted sound and cue burn. When your sound becomes muddy and muffled and the brightness of the high end is gone, it is time to clean your needle. These photos show the problems of dirt and debris build up on your needle. If left on the needle, that build up will shorten the life of your needle and lead to record wear. The Stanton SC-4 cleaner kit contains a specially formulated fluid to safely dissolve the caked-on contamination around the needle. Then the unique controlled penetration bristles of the brush will sweep and remove the debris that remains without any damage to the needle. Clean needles mean clean sound. The smallest part of your system is also the most critical. When your needle is dirty, your sound is dirty and you are adding extra wear to your vinyl. When the dirt builds up enough to give distorted sound, your customers will turn you off. These photos show the difference between clean and dirty needles. Keep your needles clean with regular use of the Stanton SC-4 cleaning kit. Your records live in a very rough environment, constant use, constant exposure to cigarette smoke and fog contamination, dirt scratches and the too often spilled drink. All of these things contribute to pops, clicks, static and cue burn which add up to poor sound. Every DJ knows about the problems associated with pops, clicks, static and cue burn. They detract from your sound and from your appearance as a professional. Finally, they cost more of your hard earned money when you have to replace that vinyl. Now you don't have to put up with those annoyances. Pops and clicks are caused by dirt and debris that is attracted to the vinyl surface. This attraction is mainly caused by the static charge that builds up on your vinyl disk. Other factors are the contaminates in the smoke and fog inside the club or dance floor, as well as the inevitable spilled drink. The Stanton VC-1 vinyl cleaner kit was designed to combat those problems that plague the DJ. The cleaning fluid is specially formulated to reduce the static on your vinyl. It also gets down into the grooves and lifts the dirt and debris so that the unique unidirectional velvet pile brush can lift and sweep them away. This cleaning fluid is strong enough to clean away even a sticky drink, but safe enough to protect your vinyl. It leaves no film or other contaminates behind. Clean vinyl means clean sound. Stanton Cartridge Guide » Download Cartridge Guide! All Stanton cartridge and styli products can be used for playback of these records by using the standard 0.7 mil spherical, 0.4 x 0.7 mil or 0.3 x 0.7 mil elliptical styli supplied with the cartridge product. All Stanton cartridges can be adapted to playback these records by the use of a 78-RPM replacement stylus. The replacement styli listed below are made for each family series of Stanton product and can be used in that specific family series, no matter the age of the cartridge. These replacement 78-RPM styli may be obtained from your local Stanton dealer and will easily replace the current stylus in your cartridge body. You may have to increase your tracking pressure in order to keep the 78-RPM stylus in the record groove at the higher 78-RPM speed. This is because the older 78-RPM records vary in their groove width and pressing characteristics. See how the Stanton legendary cartridges blow away the competition! Coming soon to a show near you! Don't wanna wait for a show? You can do the challenge yourself!! You will be amazed at the crystal clear difference. The set up - make sure your tables are level and that the pivots, counter weight and anti skating are properly adjusted. For more help on this, click here. Volume level - all cartridges do not have the same output. Similar to speaker wattages, cartridges have different mV ratings. You will find in most cases that the Stanton cartridges will sound louder at the same levels due to our cartridges having a higher mV rating. Highs - while listening to the music, try to only concentrate on the high frequencies for a bit. To do this, listen for symbols or high hats in the music. You will find that the Stanton cartridges will have a more crisp high sound than most other cartridges. Lows - next concentrate on the BASS frequencies. Listen to the booms of the music by concentrating on a bass guitar, or bass drum. Here again you will hear and feel a richer, more full sound. Switch Tables - take the cartridges off the tables that you started with them on and switch them to the other table and then repeat this test. This will demonstrate that it's not the table; rather it's the Stanton Cartridge that makes the music sound better. 2. Cue Burn - the next area that we'll want to address is Cue Burn. Cue Burn occurs due to the fact that you are taking a diamond, the toughest substance known, and is having it run over vinyl which is not even close to being the hardest substance. To do this test, pick a section of the record where you would have a normal cue point for a performance. 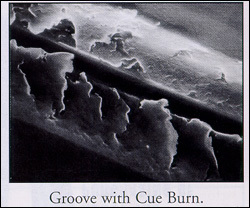 Volume levels - one aspect of cue burn is a decrease in the volume level. As you listen to the record through your cue point, does the volume tend to increase a bit a few bars into the music? For most other cartridges, you will hear a noticeable difference between the area that was scrubbed under the cue process as opposed to the Stanton cartridges. High Frequencies - now concentrate on the high frequencies again. Does the cartridge that you are using have a muddier and more unclean sound in the scrubbed area and then the highs tend to clean up once you've gotten a few bars in? Then you've just been burned by your current cartridge! 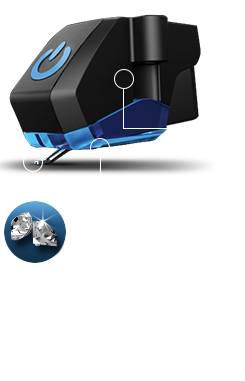 Jewelry grade diamonds in the Stanton cartridges are what allow our needles to not eat up your vinyl and your wallet like our competitors. This test is with a scrub of about 20 times. Now think of how many times you'll cue that record during your normal practices and performances and how many times you'll need to replace it due to how often your current cartridge burns it out. 3. Tracking - after you have properly set up the cartridges, see how well the Stanton cartridge tracks vs. the cartridge that you are currently using. In most cases you will shocked by how well they hold the groove, even through your toughest tricks. This is why artists like DJ Analyze, and Kool Herc are among just a few who stick with the Stanton cartridges. Check out what a few more artists have to say. Once you've taken the Challenge, we're sure that you'll be sold on the Quality of the Stanton Cartridges and that you'll want to have your friends take the challenge as well!!! Stanton cartridges have been setting landmarks in stylus design for decades!